Well, this phrase is applicable to many aspects of Parkinson’s, because in the absence of specific fully functional genes (such as PARK genes and other genetic risk factors), biological processes will eventually run amok. And this dysfunctional activity is believed to be associated with many cases of Parkinson’s, particularly the early onset forms (under 40 years of age). Title: Reversible Conformational Conversion of α-Synuclein into Toxic Assemblies by Glucosylceramide. Authors: Zunke F, Moise AC, Belur NR, Gelyana E, Stojkovska I, Dzaferbegovic H, Toker NJ, Jeon S, Fredriksen K, Mazzulli JR.
Journal: Neuron 2017 Dec 20. pii: S0896-6273(17)31135-2. In this research report, the investigators were interested in how disrupted glycosphingolipid clearance plays a key role in the clustering (or aggregation) of the Parkinson’s associated protein alpha synuclein. Glycosphingolipids (or GSLs) are a subtype of glycolipids that contain sphingosine. A glycolipids is basically a lipid in the cell membrane with a carbohydrate (or chain of carbohydrates) attached. Ok, and what does any of that actually mean? Lipids are molecules that contain hydrocarbons, and they form the building blocks of many of the structures in living cells, such as the membrane that surrounds the cell and keeps everything inside. As you can see in the image below, there are two layers of lipids (yellow) making up the cell membrane. Scattered about the membrane, located in between all of those lipids are proteins that will have carbohydrates attached. These are called glycoproteins. But hang on a second. Above you were talking about glycolipids, not glycoproteins. What’s the difference? The primary difference between the two is that with glycoproteins the carbohydrates attach to a protein, while with glycolipids the carbohydrates attach to lipids in the membrane (it’s a slightly more complicated than that, but don’t worry about it for now). Interestingly, these carbohydrate chains are only present on the exterior surface of the membrane. The interior surface is devoid of any carbohydrates. What do these chains of carbohydrates do? They have many functions, from acting as an adhesive (by linking neighbouring cells together, these chains help maintain the integrity of the tissue) to helping the immune system determine what is ‘self’ and what is foreign. Focusing on glycolipids for the purpose of today’s post: there are two different types of glycolipids: Glyceroglycolipids and Glycosphingolipids. The latter is the important one for todays research review. Glycolipids share a common basic structure, and it’s the bits added on that determine the difference between Glyceroglycolipids and Glycosphingolipids. Those added on bits are not important for today’s post (Glycosphingolipids are characterised by the presence of a sphingosine structure, but please don’t ask what that means – that would be a whole different post). But the way that these glycolipids are disposed of is important for today’s post. On a fairly regular basis, the small part of the external layer of the cell membrane is brought inside the cell. This is a process called endocytosis. It occurs when the cell consumes resources from the outside world in order to find what it needs to function and survive. As a section of cell membrane is brought into the cell it forms a vesicle (a small spherical bag of stuff) that is referred to as an endosome. Once the endosome is inside the cell and detached from the rest of the membrane, it will bind with another vesicle which is called a lysosome. 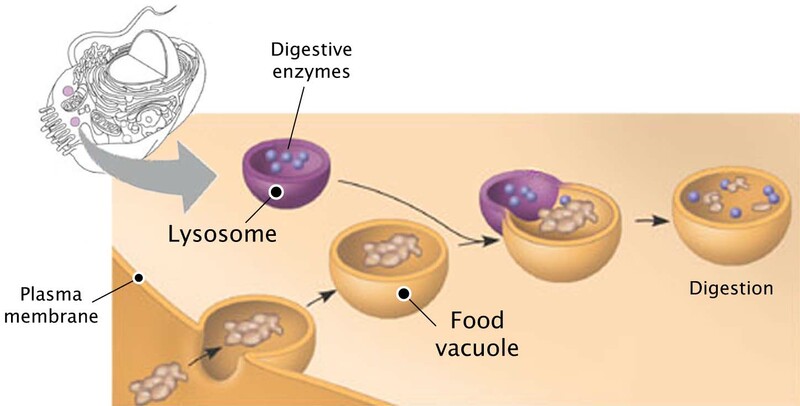 A lysosome is a small bag that is full of digestive enzymes, which help to break down the contents of the endosome. This process will provide the cell with the basic components that it needs to function normally. Think of the commercial products that you use for washing your clothes. The reagents that you put into the washing machine with your clothes contain a multitude of enzymes, which help to break down the dirty, bacteria, flakes of skin, etc that cling to your clothes. Each enzyme breaks down a particular protein, fat or such like. This is very similar to the collection of enzymes in the lysosome. All of them are needed to break down all of the contents of the endosome… there is even an enzyme for breaking down glycolipids like glycoshingolipids. And this is where we come back to the research report mentioned above. In that research report, the investigators were interested in how a disruption of the process of breaking down glycosphingolipids plays a key role in the clustering (or aggregation) of the Parkinson’s associated protein alpha synuclein. If glycosphingolipids are not broken down properly, they start to accumulate. What enzyme breaks down glyco…sphingo..whatevers? Glucocerebrosidase (also known as GCase) is an enzyme in the lysosome that is involved in breaking down of glycosphingolipid. The instructions for making the enzyme glucocerebrosidase are provide by a gene called GBA1 (also known as simply GBA). Pub quiz question: Take a wild guess which gene in your DNA is one of the most commonly affected genes in Parkinson’s? According to the Michael J Fox foundation webpage on GBA1 “up to 10 percent of people with PD in the United States carry” a genetic variant in the GBA1 gene. As I said, it is one of the most common risk factors for increasing ones chances of developing Parkinson’s. GBA1 is a large gene and there are numerous genetic variants spread across its length. The most common mutations are located in positions N370S and L444P. Given that genetic variants in the GBA1 gene are so common in the Parkinson’s community, a great deal of research is being conducted on this particular gene. And last year that research effort got a large boost. So with both the Michael J Fox Foundation and the Silverstein Foundation investing in GBA-associated Parkinson’s research, we can expect a lot of new GBA-associated data this coming year. In their research report, the investigators were interested in how a disruption of the process of breaking down glycosphingolipids plays a key role in the clustering (or aggregation) of the Parkinson’s associated protein alpha synuclein. The researchers started by growing cells from both normal healthy individuals and people with a GBA1 genetic variant (N370S). They encouraged those cells to become dopamine neurons, and they found that normal control cells treated with a chemical that inhibited the enzyme glucocerebrosidase (conduritol-b-epoxide) began to exhibit very similar features to those found in the cells with a GBA1 mutation. In particular, they found accumulation of alpha synuclein protein, which collected into two different sized aggregates that the investigators called ‘high molecular weight’ (HMW) and ‘low molecular weight’. Next they investigated what effect the presence or absence of glycosphingolipids had on this process. Interestingly they discovered that glycosphingolipids altered the state of physiological the alpha synuclein preferentially in the high molecular weight aggregates (rather than the low molecular weight clusters). 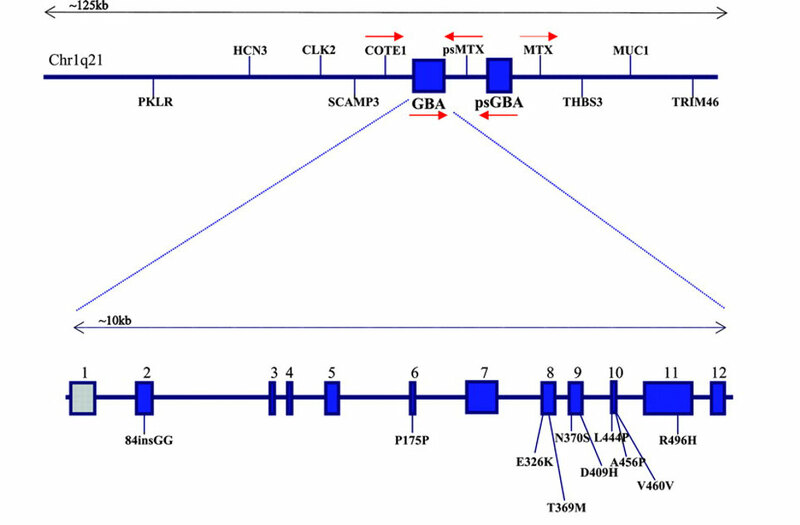 And even more interestingly: this alteration occurred in cells with and without GBA1 mutations. The researchers found that if the high molecular weight aggregates of alpha synuclein were exposed to glycosphingolipids, then the high molecular weight aggregates of alpha synuclein suddenly became toxic (forming fibrils and killing the cell). 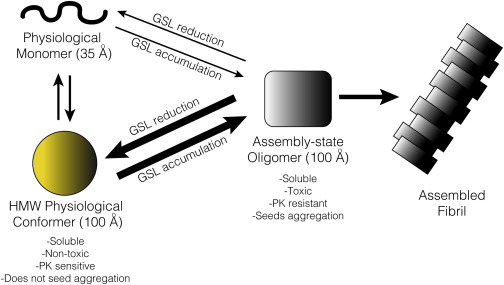 And this process was reversible: simply by reducing the levels of glycosphingolipids that the aggregates were exposed to, the high molecular weight alpha synuclein clusters could be returned to a less toxic form. The researchers concluded that glycosphingolipids control the toxic conversion of alpha synuclein in a reversible manner “that is amenable to therapeutic intervention by glycosphingolipids reducing agents”. Thus, if we could just find a treatment that either increases production of the enzyme glucocerebrosidase (to break down glycosphingolipids) OR a compound that inhibits or reduces the production of glycosphingolipids, they could potentially be useful in the treatment of Parkinson’s. What? No. We’re not finished yet. Title: GBA1 deficiency negatively affects physiological α-synuclein tetramers and related multimers. Authors: Kim S, Yun SP, Lee S, Umanah GE, Bandaru VVR, Yin X, Rhee P, Karuppagounder SS, Kwon SH, Lee H, Mao X, Kim D, Pandey A, Lee G, Dawson VL, Dawson TM, Ko HS. Journal: Proc Natl Acad Sci U S A. 2018 Jan 8. pii: 201700465. In this study, the researchers found that glycosphingolipids accumulate when they artificially reduced levels of the enzyme glucocerebrosidase in cells. And this manipulation led to destabilisation of normal alpha synuclein structures (called tetramers). The investigators also observed a very similar situation (accumulation of glycosphingolipids and destabilisation of normal alpha synuclein tetramers) in human dopamine neurons that contain a GBA1 mutation (L444P). The researchers next treated the cells that have a GBA1 mutation with the drug Miglustat. Miglustat functions as a competitive and reversible inhibitor of the enzyme glucosylceramide synthase. This is an enzyme that is required for the production of glycosphingolipids. By treating GBA1 mutant cells with Miglustat, the investigators reported reduced glycosphingolipids accumulation and stabilised the alpha synuclein tetramers, as well as protection of the cells from the toxic versions of alpha synuclein. The investigators concluded that their data provides some insights into how GBA1 regulates the different forms of alpha synuclein and also point towards unique therapeutic opportunities for Parkinson’s. EDITOR’S NOTE #1: While Miglustat has been used on individuals with GBA1-associated Parkinson’s before (Click here to read more about this), there is no any evidence that it actually works yet. It has never been clinically tested for this purpose. 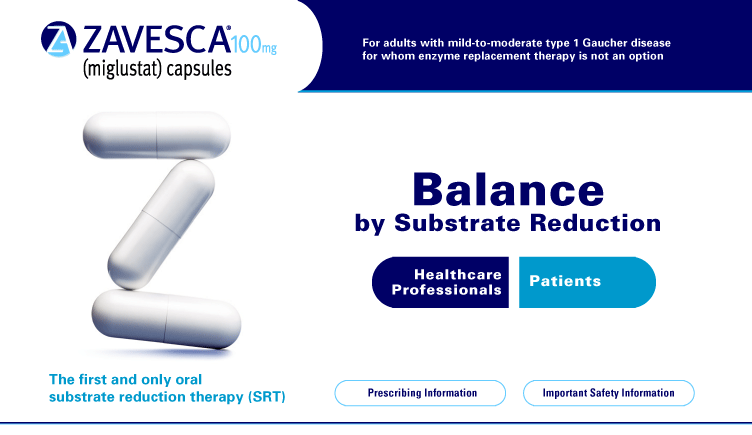 And given that this drug can cause debilitating side effects (Click here to read more about this), please speak with your medical physician before considering any change in an existing treatment regime. The SoPD can not be held responsible for any actions taken based on information provided here. The information provided is for educational purposes only. Mmmm. Again, interesting. So summing up now? Still not finished. And you will want to read on. All of this research reinforces a series of clinical trials that are currently being conducted for Parkinson’s, because these trials are all seeking to increase the enzyme glucocerebrosidase levels and reduce glycosphingolipids. There are two clinical trials testing Ambroxol in Parkinson’s in two different “Londons” (London, UK and London, Canada). The first study (named AiM-PD) is a phase IIA Prospective, Single-Centre, Open Label Clinical Trial to evaluate the safety, tolerability and pharmacodynamic effects of Ambroxol in Parkinson’s (Click here to read more about this trial). This trial, which is funded by the Cure Parkinson’s Trust and the Van Andel Research Institute(USA), is being conducted at the Royal Free Hospital in London (UK). It is testing the safety of slowly increasing doses of Ambroxol in Parkinson’s. The researchers are also looking to see if Ambroxol can increase levels of glucocerebrosidase activity and whether this has any beneficial effects in the subjects. The study has been conducted over a 6 month period, on 20 people with Parkinson’s (critically 10 people with the GBA variant and 10 people with out a GBA mutation – Click here to read more about it). We are expecting results from the AiM-PD study in 2018. The second study is being conducted by the Lawson Health Research Institute (and the Weston Foundation) in Canada, and it is a phase II, 52 week trial of Ambroxol in 75 people with Parkinson’s Dementia (Click here to read more about this trial). In this randomised, double blind study, two doses of Ambroxol will be tested – a high dose (1050 mg) and a low dose (525 mg) – as well as a placebo treated group. While this second trial will finish in the second half of 2018, we are not expecting results from this study until 2019. In addition to the Ambroxol trials, readers will be interested to know that the biotech company Sanofi Genzyme is conducting a series of clinical trials that are focused on a drug that will reduce glycosphingolipids levels. The phase II trial, called MOVE-PD, is testing the efficacy and safety of a drug called Venglustat (also known as GZ/SAR402671 – Click here to read more about this clinical trial). Similar to the drug Miglustat (described above), Venglustat is a glucosylceramide synthase inhibitor. Glucosylceramide synthase is an enzyme involved in the production of glucocerebroside. Thus, by blocking glucosylceramide synthase, Sanofi Genzyme are hoping to reduce the production and consequent accumulation of glycosphingolipids in people with a mutation in the GBA gene. This approach is trying to reduce the amount of protein that can not be broken down by the glucocerebrosidase enzyme. The MOVE-PD study will enrol more than 200 patients worldwide (Click here to read more on this). Now that really is interesting! Are you finished? There is also another biotech company that is focused on this area of Parkinson’s research. That company is called Lysosomal Therapeutics. 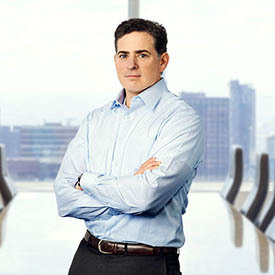 Lysosomal Therapeutics was founded by Dr Joseph Mazzulli (the lead scientist on the first research report reviewed above), Prof Dimitri Krainc (also at Northwestern University) and former Genzyme executives in 2011. The company is focused on discovering and developing compounds that will increase the activation of the glucocerebrosidase enzyme. Currently they are focused on Parkinson’s, for which they are developing a drug called LTI-291. Preclinical studies have shown that LTI-291 easily crosses the blood-brain-barrier and accesses the glucocerebrosidase enzyme within the brain. Lysosomal Therapeutics have partnered with the Irish Pharmaceutical company Allergan to take LTI-291 into Phase I clinical trials (Click here to see the press release – we are hoping to see this trial starting in 2018). One last comment though before anyone asks: I am not aware of any natural activators of GBA1 or the enzyme glucocerebrosidase in common sources of food (very happy to be corrected on this if anyone has data). So, summing up – what does it all mean? It means that 2018 is off to an amazing start! We are only 10 days into the new year and already we have fascinating pieces of Parkinson’s research being published, validating each others basic findings, AND supporting the theory behind several major clinical trial programs. Researchers have provided evidence that small proteins called glycosphingolipids may be playing an influential role in the protein aggregation associated with Parkinson’s. 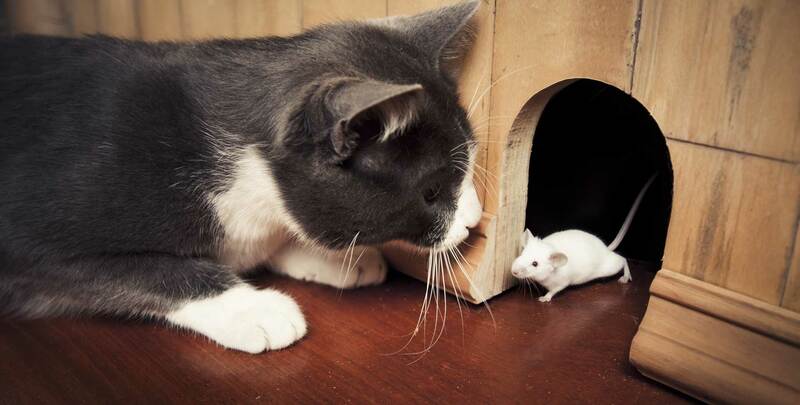 Luckily, clinical trials are currently underway testing drugs that reduce the levels of glycosphingolipids. It will be interesting to see how those trials progress, hopefully leading to a novel treatment for Parkinson’s. EDITOR’S NOTE #2: The information provided by the SoPD website is for information and educational purposes only. Under no circumstances should it ever be considered medical or actionable advice. It is provided by research scientists, not medical practitioners. Any actions taken – based on what has been read on the website – are the sole responsibility of the reader. Any actions being contemplated by readers should firstly be discussed with a qualified healthcare professional who is aware of your medical history. While some of the information discussed in this post may cause concern, please speak with your medical physician before attempting any change in an existing treatment regime. In addition, many of the companies mentioned in this website are publicly traded companies. That said, the material presented on this page should under no circumstances be considered financial advice. Any actions taken by the reader based on reading this material is the sole responsibility of the reader. None of the companies have requested that this material be produced, nor has the author had any contact with any of the companies or associated parties. This post has been produced for educational purposes only.